Life in Florida is very colorful. The brilliant white sands of the panhandle make a perfect backdrop to emphasize the vibrancy and exotic aura of the subtropical things that live there. And of course, when camping you are close to the earth, facing nature at almost every step, rather than being insulated from it by man-made structures (hotel rooms, concrete walkways, swimming pools). On our last day we started to count up the colorful things we had encountered — for good or for ill. 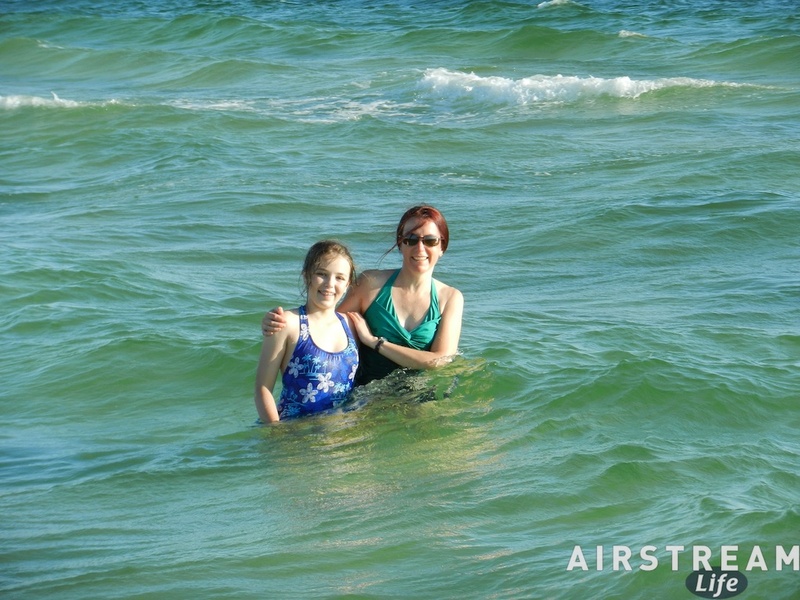 Item #1: Emma took a break from homeschooling on Monday afternoon to visit the beach one last time. The waves were still moderate, but at little higher than on the previous calm days. The red-fringed jellies we had noted earlier seemed to be absent, but while splashing around she got stung by jellyfish tentacles and in that moment discovered just how much that can hurt. 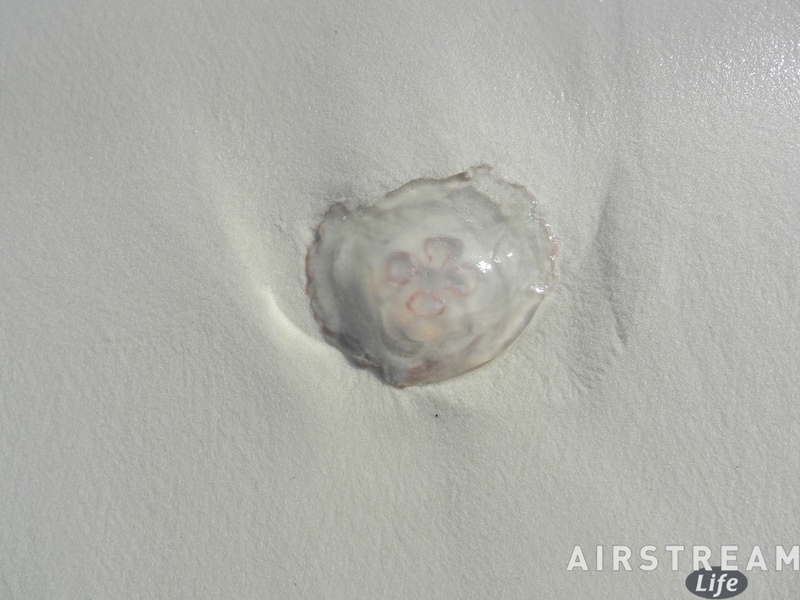 We never saw the jellyfish that did the deed, and fortunately Emma got only a glancing swipe that left three 2-3″ marks on her leg — enough to get her attention (she likened it to a bee sting), but not enough to do any serious damage. 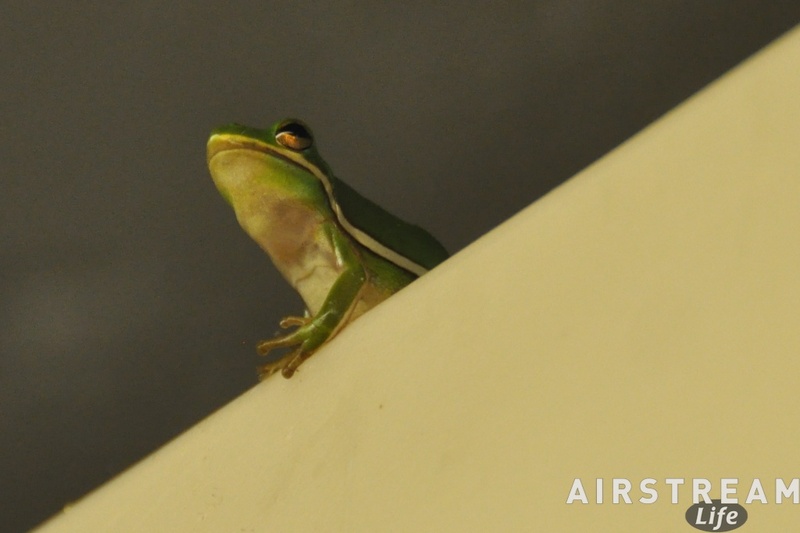 Item #2: In the campground shower we’ve noticed a few peeping Toms, or to be accurate peeping Green Tree Frogs. They sit up above the showers on a shelf, or stick to the walls with their three-toed suction cup feet, and just silently stare at you while you are showering. They’re sort of cute, benign little companions, and we favored their participation in the shower since (we theorized) it helped hold down the mosquito population. Item #3: Right across the bay is the Naval Air Station where the famous Blue Angels are based. If you are camped here during the week there’s a good chance you’ll see them practicing overhead. We got a free air show on Tuesday morning while packing up to depart. 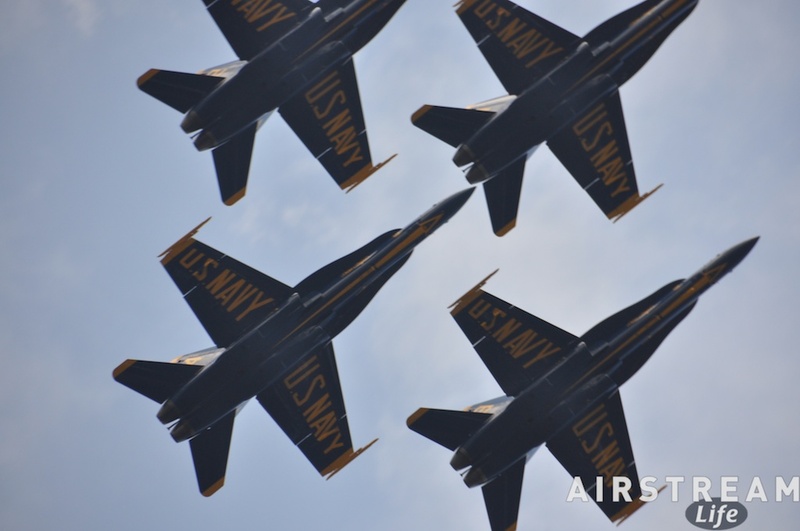 If you aren’t a fan of jets streaking overhead and nearby, you might want to consider someplace else, or find a week when the Blue Angels are doing a show away from home. So that’s green tree frogs in the shower, red jellies in the water, and blue angels flying overhead. Florida was a magical place even before Walt made it official. With Pensacola behind us, we’re obligated to make some miles now. Our goal is near Ft Worth, where we have arranged to have a new air conditioner installed on Friday. So for Tuesday it was drive-drive-drive, with only one significant stop, at the new “Airstream of Mississippi” dealership in Gulfport MS. We parked the Airstream in their lot next to inventory of about a dozen new Airstreams, and met president Rick Foley and sales rep Gillis Leger. Both of them are great guys, very friendly. Gillis and I bonded a little when he learned I was an LSU grad, since he’s from Baton Rouge. Being new, they haven’t gotten full up and running for service (otherwise we’d have had the new AC installed there) but it’s obvious that Rick means to have a top-notch Airstream dealership. Once they are fully ready, I expect we’ll see Airstream of Mississippi in the pages of Airstream Life. We made it Alexandria LA on Tuesday (417 miles) and spent the night tolerably well given that the daytime high here was 94 degrees. You can do amazing things with three vent fans. Still, it will be nice to have our air conditioner fixed soon. Since the forecast along our route is for temperatures in the mid-90s, we’ll spend today in the air conditioned car and stop only after the heat has begun to abate. Rich, loved the frog shower police. Much better than the large banana slugs that used to be in my shower when I lived in the redwoods in Northern California. The Ft. Pickens info was interesting too—I think you’d posted a long while back about being in St. Augustine, FL, where there’s an ancient Spanish fort, and some of the oldest buildings in the U.S. And good cigar rollers, at least when I was there. Loved the frogs that visited us on Mustang Island on the gulf coast of Texas. We had them in the shower and on our water inlet handle – pretty cute fellas. Safe travels!